In this episode, we started the show by looking back at the Patriots victory against the Packers. We ended the show by previewing the upcoming game against the Titans. This entry was posted in Patriots Podcast and tagged Bill Belichick, Green Bay Packers, Patriots, Tennessee Titans, Tom Brady on November 8, 2018 by Russ Goldman. The Patriots won their sixth game in a row and in impressive fashion defensively downing Aaron Rodgers and the Green Bay Packers 31-17. The win, while not quite as big as the one over Kansas City was a big one nevertheless, given the pregame hype that was dropped on this. Missing three of their key players on the offensive side of the ball, the Patriots defense rose up to play their best game of the year, holding the Packers to their season low in points and making Rodgers and the explosive Packers to earn everything they got. Tom Brady, despite missing Rob Gronkowski, Sony Michel and RG Shaq Mason on offense, and going thru a rough stretch in the third quarter still managed to put up 31 points on offense which should not be forgotten. After struggling thru the third quarter and with the game on the line, Brady delivered and led the Patriots on two huge drives to get the winning touchdown and then put it away. Facing a 3rd and 7, he whistled a nice 17-yard pass to Phillip Dorsett that got the drive going. It finished up with the James White touchdown to take a 24-17 lead. On the 55-yard touchdown pass to Josh Gordon, Brady expertly baited the young Packers corners, by staring down Julian Edelman, who waved for the ball. The corners bit and then Brady lasered a pass over their heads to Gordon who was wide open. Once he made the one player miss, it was an easy touchdown reception. Rather than downplay the meeting of two HOF QBs this week, both Brady and Rodgers embraced it and engaged in a mutual admiration game where it is clear that they both greatly respect one another. Much to the chagrin of the national “Brady may be done” crowd, he outperformed Rodgers going 22-35 for 294 yards, with 1TD for a 99 QB rating. James White was injured in the 2nd quarter of the game and for a few minutes, all of New England was holding their collective breath. He had 31 yards on the ground and caught 6 passes for 72 yards and after the game seemed fine meeting with the media in the locker room, something the Patriots normally don’t allow if a player is hurt. Cordarrelle Patterson had another solid game, the wide receiver is filling in for Sony Michel while he’s injured and showcased his tremendous speed while bursting off the line and contributing 61 yards. He scored a touchdown after ripping of a number of impressive runs on a drive where he appeared to be shot out of a cannon. He’s embraced his chance to help out the team and again deserves high marks. Kenjon Barner had just one carry but on a blitz pickup, he’s sure to get praise from Brady when he leveled Clay Matthews who was coming straight up the A-Gap. The wide receivers had a solid night overall but were led by Josh Gordon. Gordon has given the offense the player that can go high and catch those jump balls that they’ve lacked. He high-pointed a 29-yarder over Bashaud Breeland down the sideline in the first half that was a beauty. He had another that was ruled out of bounds but was one on second glance that the Patriots should have challenged. In our pregame matchups this week we wrote that this game was tailor-made for Julian Edelman. And we hit the nail right on the head for that one. Edelman caught six passes for 71 yards, he added 28 more on two very well disguised Jet sweeps. And then he dusted off his old Kent State throwing arm and completed a double pass to James White for 37 yards. Simply outstanding all-around effort. Phillip Dorsett had that huge drive starter for 17 yards with the score tied in the fourth quarter. Chris Hogan wasn’t a big part of the game plan this week. Rob Gronkowski was out this week with ankle and back injuries and Dwayne Allen was the lone Patriots tight end…again. His value is mainly as a blocker and he’s very good at that and he once again proved his worth there. But on Sunday night, he chipped in with a big 21-yard reception on a pass down the right sideline. That bumped his grade up a bit. The offensive line had a nice comeback night after their down week in Buffalo. With both teams daring the other to run, the Patriot offensive line was able to open some holes against the Packers defense. They ran for 123 yards without Michel and utilizing a true ground game committee. The pass protection overall was very good, but they did have their lapses in communication with Ted Karras in there that allowed two sacks. The defensive line was immense in this one. Despite the fact that the Patriots blitzed very little, they pressured Aaron Rodgers on nearly 50 percent of his throws Sunday night. The coaches moved Trey Flowers inside and he wreaked havoc all night long. Don’t be swayed by the fact that they only had one sack. The pass rush in this one was consistent and effective all night long. Flowers was everywhere, he topped off his best game of the year last week with an even better one against the Packers. He and Adrian Clayborn combined for a sack, but the overall play of the defensive line was outstanding. Danny Shelton and Malcolm Brown barely played as they went lighter with Adam Butler and Flowers inside trying to create some interior pressure. With going lighter, they dared the Packers to run and they did …to a degree. But Lawrence Guy provided the turning point of the game with a forced fumble on Aaron Jones which Stephon Gilmore recovered. The Patriots linebackers initially looked like they were going to be targeted in the passing game, but either thru the coaching of the Packers or solid play, they never became a factor at all. The linebackers were good in run support despite the lighter fronts they were running. But where they truly excelled was in keeping Rodgers in the pocket and not allowing him to scramble for yards. The containment (which we always harp on) was outstanding. Rodgers ran four times for just eight yards. And when he did attempt to scramble they were contesting everything. The entire front seven made it a very long uncomfortable game for Rodgers. The secondary had another strong game against a much, much better group of receivers than they faced in Buffalo a week ago. Stephon Gilmore goes to the head of the class. He was squared up with Davante Adams for much of this game and shut him down. Against Gilmore, Adams had 2 catches for 15 yards. Overall he finished with six catches for 40 yards after having over 400 combined yards in his previous three games. The used the defensive backs to blitz a few times and once it worked perfectly with Devin McCourty forcing Rodgers to unload a wildly inaccurate pass. But the other time, Rodgers recognized Duron Harmon coming, it was picked up and he rifled a 51-yard pass to the blistering fast Marquez Valdes-Scantling who beat Jason McCourty off the line. Pat Chung had some issues with Jimmy Graham but on the touchdown pass, it was one of those plays where the DL didn’t get any pressure and Rodgers had time to wait for Graham to run down the right side and then cut all the way across the field where he got separation in the left corner of the end zone. With Adams pretty much a non-factor and Graham held to just 51 yards, this was the kind of effort the secondary has been looking for. The Special Teams also made a huge comeback this week. Stephen Gostkowski was automatic …as usual. Ryan Allen, despite only punting a couple of times had an outstanding game, pinning the Packers twice inside their 20-yard line. He averaged 49.6 yards per punt. The coverage units were much improved. Cordarrelle Patterson had two solid kickoff returns of 36 and 28 yards to go along with his running back duties. The Patriots coaching staff aced this test. With the national media in the excuse making department for Rodgers after he failed to get the better of Brady, they pointed to the coaching matchup of Belichick versus McCarthy as the difference. And in reality, Belichick can and did coach circles around the overrated McCarthy. Josh McDaniels coached a fantastic game offensively, despite spitting the bit on a sequence where the Patriots had a 1st and goal at the one and failed to score any points. However, the decision to come out lightning fast immediately put the Packers on their heels. That was a brilliant move and worked to a tee. McDaniels has a knack for knowing the exact perfect time to unleash those trick plays and they generally work out perfectly. The flea-flicker and the double pass by Edelman were perfectly executed. The latter had the Packers so confused, it appeared that there were no Packers on the left side of the field where White rolled down inside the five before being caught from behind. Defensively Belichick and Brian Flores had an outstanding game plan, holding the Packers to a season-low 17 points. Rodgers had 259 yards passing but everything, every yard was contested. He averaged 6.2 yards per pass, had a QB rating of 89 and in the fourth quarter? He completed just 2-7 for 15 yards. 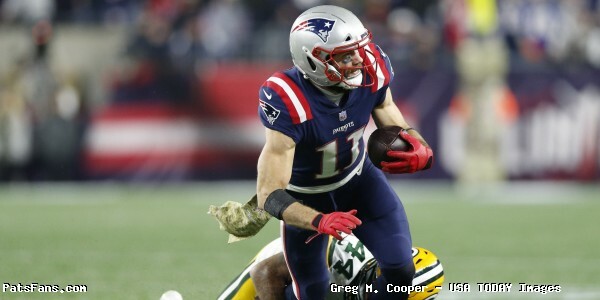 This entry was posted in 2018 Patriots Regular Season, NFL Commentary, NFL News, Patriots Commentary, Patriots Film Room, Patriots News, Patriots Twitter and tagged 2018 Patriots season, Aaron Rodgers, Bill Belichick, Chris Hogan, Davante Adams, Dont'a Hightower, Green Bay Packers, James White, Marquez Valdes-Scantling, New England Patriots, NFL, Patriots, Patriots edge rushers, Rob Gronkowski, Stephon Gilmore, Tom Brady, Trey Flowers on November 6, 2018 by Steve Balestrieri. The New England Patriots pulled out a tough victory over the Green Bay Packers 31-17 on Sunday Night Football in only the second meeting between Aaron Rodgers and Tom Brady, and perhaps the last. Both quarterbacks looked excellent at times and struggled at others. But Brady rallied his team in the fourth quarter with two touchdown drives and the Patriots pulled away after forcing a fumble where it appeared Green Bay would take the lead. The Patriots defense,much-maligned by the fans on social media actually played a very strong game, holding Rodgers and the Green Bay offense to just 17 points. The game plan was to mainly use Stephon Gilmore to shut down Davante Adams. Adams this week, proclaimed for all to hear that he didn’t believe anyone could cover him. And who could blame him? His last three games, he’s had 133, 140, and 132 receiving yards. Well, Gilmore just put that thought to bed. Gilmore blanketed Adams to where the talented wide receiver was becoming frustrated to the point where the Packers were trying to force the ball underneath to him, just to get him involved. Adams finished the night with 6 catches for 40 yards. Mission accomplished. The Patriots pass rush had only one sack but were getting good pressure on Rodgers all night long and his mobility didn’t allow him to make as many plays as we’ve seen in the past. Trey Flowers was outstanding and Adrian Clayborn had his best game in a Patriots uniform. Rodgers final numbers? 24-43 for 259 yards with 2 TDs with an 89.2 passer rating. Not bad but not great either. But Rodgers 4th quarter numbers? 2-7 for 15 yards. That is pretty impressive for the Patriots defense against any QB. Much of the talk pregame was “who gets the ball last will win”, well the defense put that to bed as well. Mission Accomplished 2. Brady finished 22-35 for 294 yards with 1 TD with a passer rating of 99.0. Julian Edelman had one pass and completion to James White for 37 yards. With Rob Gronkowski, Sony Michel, and RG Shaq Mason out, the Patriots had to get creative offensively…and they did. A Flea Flicker, a double pass and using WR Cordarrelle Patterson as a tailback again were just some of the things we saw. Patterson is quickly proving to be much more than the one-trick pony kick returner that the team signed this spring. He carried 11 times for 61 yards and had one touchdown and another taken away when the review showed him down just short of the goal line. Josh Gordon, dislocated his fingers early in the game but played on and had five catches for 130 yards and a touchdown to ice the game. 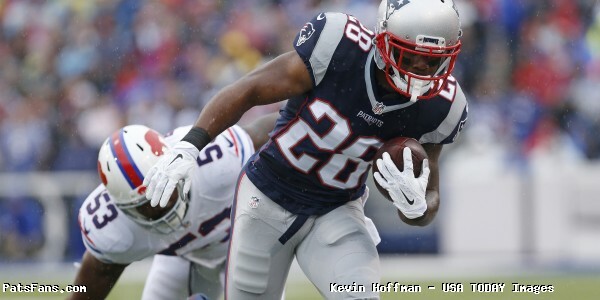 Julian Edelman had six catches for 71 yards, James White had six for 72 and added 31 yards rushing. The Patriots got the opening kickoff and went on a blistering pace where they were moving faster than Han Solo when he did the Kessel Run in less than 12 parsecs. They moved easily down the field where the Packers’ defense was having trouble even getting set and never able to catch their breath. James White took it in from the 8-yard line for the first of his two TDs on the ground. Rodgers answered and led the Packers on a 62-yard drive but only came away with three. It was clear, that although Rodgers and the Packers could move the ball, the Patriots defense was making them earn their way down the field and nothing was coming easy. The Packers would tie it at 10-10 when Rodgers hit Adams with a 2-yard pass on 3rd and goal after he scrambled away from pressure. 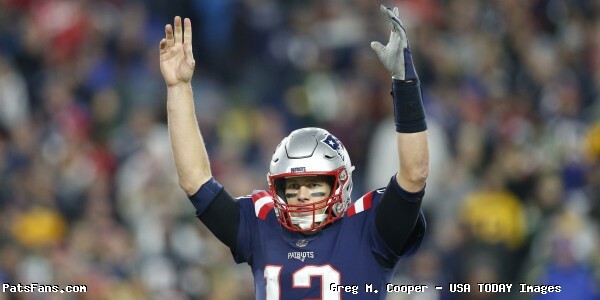 But the Patriots answered the bell and Brady led them on a 7-play, 69-yard drive, nearly all of which was on the ground, with Patterson battering his way into the end zone from 5 yards out and the Pats went into halftime up 17-10, because there were no heroics by Rodgers at the end of the half. The defense did their job. Rodgers and the Packers took the third quarter kickoff and went 76 yards to tie the score. The big play was a 51-yard bomb from Rodgers to Marquez Valdes-Scantling. The rookie has incredible speed and cleanly beat Jason McCourty and Rodgers dropped the ball in the bucket. On 2nd and goal from the 15, Rodgers had a ton of time and that allowed Graham to run all the way across the field where Rodgers lasered a pass in the back of the end zone. That tied the score at 17. Brady drove the Pats down the field but they were stuffed on four attempts after getting a first and goal at the one. The Packers played some incredible defense but the play calling in that sequence was a bit curious, to say the least. After trading possessions, Rodgers had the Packers moving at the end of the third quarter. After back-to-back great plays by Rodgers and Valdes-Scantling for 50 yards, the Pack had the ball at the New England 34. Aaron Jones carried for six yards, but Lawrence Guy coming up from behind, punched the ball loose where Gilmore recovered. Crisis averted and the momentum switched back to New England. Brady and the Patriots went 76 yards for the go-ahead score. On a 3rd and 7, Brady hit Phillip Dorsett with a huge 17-yard catch to move the chains. Then they dusted off the double pass from Edelman to White for 37-yards. White powered it in and the Pats had the lead they would not relinquish. On the ensuing drive, Rodgers was sacked by Flowers and Clayborn to force a three and out. On 2nd and 10 at the New England 45, Brady faked out the Packers DBs, by staring down Edelman in the flat. Two defenders raced up as Edelman waved his hand for the pass. Brady then looked downfield and hit Gordon who was wide open. He loped easily for a 55-yard touchdown. That was it, game over, thanks for coming and ensure your trays are locked and in the upright position. Mission accomplished 3. Stephon Gilmore – The Patriots paid Gilmore last year like one of the top CBs in the league. After a slow start to his career here, he was excellent in the second half of the season. This year, there is no doubt the Pats paid the right corner as he’s been simply outstanding since the spring. Gilmore had the big task of shadowing Adams for much of the night and he did so frequently without any help. And he was outstanding. Adams had over 400 yards in his last three games and had 40 tonight. That is Ty Law/Revis territory folks. Trey Flowers – This guy is really turning it on the past few weeks. And he was simply overpowering at times tonight. Despite being held frequently, Flowers was a disruptive influence all night long. He did a great job of setting the edge and getting pressure on Rodgers, on one play, beating his man and then a double team before forcing Rodgers to throw the pass off-target. Flowers is the gaudy stat machine some edge players are…but he’s no less valuable to this defense than any of those players are to their respective teams. Perhaps even more so. He’s going to get paid. Josh Gordon – Gordon had his fingers get dislocated a few times during the game, but toughed it out, had them jammed back in and kept going. That alone deserves praise. But his ability to go up and grab contested passes is something no other receiver other than Gronkowski is really able to do. He put the dagger in the Packers with the 55-yard TD catch and run and had his first really big game in a Patriots uniform with 130 yards and a score. 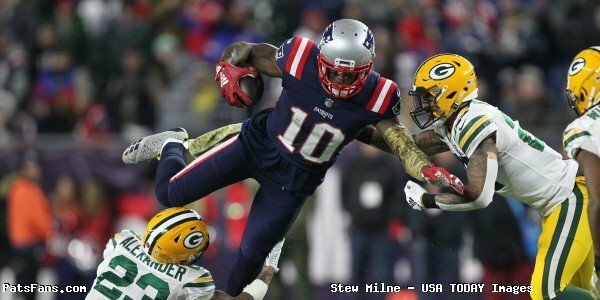 This entry was posted in 2018 Patriots Regular Season, NFL Commentary, NFL News, Patriots Commentary, Patriots Film Room, Patriots News and tagged 2018 Patriots season, Aaron Rodgers, Adrian Clayborn, Bill Belichick, Davante Adams, Green Bay Packers, James White, Julian Edelman, New England Patriots, NFL, Patriots, Patriots edge rushers, Rob Gronkowski, Stephon Gilmore, Tom Brady, Trey Flowers on November 5, 2018 by Steve Balestrieri. The New England Patriots return home and face off next against the Green Bay Packers in yet another primetime game this Sunday night. Remember when the Patriots played on Sunday afternoons? This primetime stuff is getting ridiculous. A lot of the fun of watching two future Hall of Fame QBs with Tom Brady and Aaron Rodgers going head to head against one another is lost when the ridiculous “who’s better” crap gets injected into the equation ad nauseam. Like our politics of today, neither side is going to budge, so just sit back and enjoy the offenses of each doing their thing on Sunday and revel in it. These matchups aren’t going to be around much longer. This is an important game for both teams, the Patriots have won five in a row and are right in the mix for one of the top teams in the AFC and an all-important first-round bye in the playoffs. The Packers are a much better team than their 3-3-1 record and need to get on a roll. They nearly pulled off a huge upset last week against the undefeated Rams. So, how they react this week will have a lot to say about the rest of their season. The Patriots very talented corner has been outstanding all season and is now facing arguably his toughest test of the season. Davante Adams is Rodgers go-to guy and he’s having an outstanding season. He’s caught 52 passes for 690 yards and 6 TDs thru just the first seven games of the season. He’s on pace for 118 catches, 1,577 receiving yards, and 13 touchdowns. Gilmore will have his hands full with the speedy Adams who said this week, he doesn’t believe anyone can cover him. And he may be right, the Patriots may have a plan for Gilmore to cover him underneath with safety help over the top. It would seem to be the normal Patriot M.O of trying to limit the top weapon of the opposition. If it isn’t Adams, Gilmore would draw Randall Cobb, not much of a break there is it? But regardless, Gilmore has been outstanding since the first OTA session this spring. He should garner some serious Pro Bowl consideration this winter. The soft-spoken Gilmore has drawn Sammy Watkins of the Chiefs, Allen Robinson of the Bears and Kelvin Benjamin of the Bills the past three games. Those receivers combined for a total of five catches for 67 yards in those three games. Opposing QBs have only completed 28 percent of the passes targeting WRs Gilmore is covering. This should be a great matchup. The Patriots best player on the front seven had a tremendous game against the Bills on Monday night. Six tackles, two tackles for loss, two QB hits and he should have had an interception of Derek Anderson but couldn’t hold on. This week the stakes and the quarry are much, much tougher. The Patriots remember what Aaron Rodgers did to them in Green Bay a few years ago. The front seven will have to play a very fine balancing act. They have to be able to pressure Rodgers enough to get him to get rid of the ball asap but do so in a way that keeps him contained in the pocket. If he breaks containment, very bad things will happen and all of them will happen to the defense. They’ll need a big effort from everyone on the defensive front seven but a lot of the pressure will be on Flowers to lead the way. 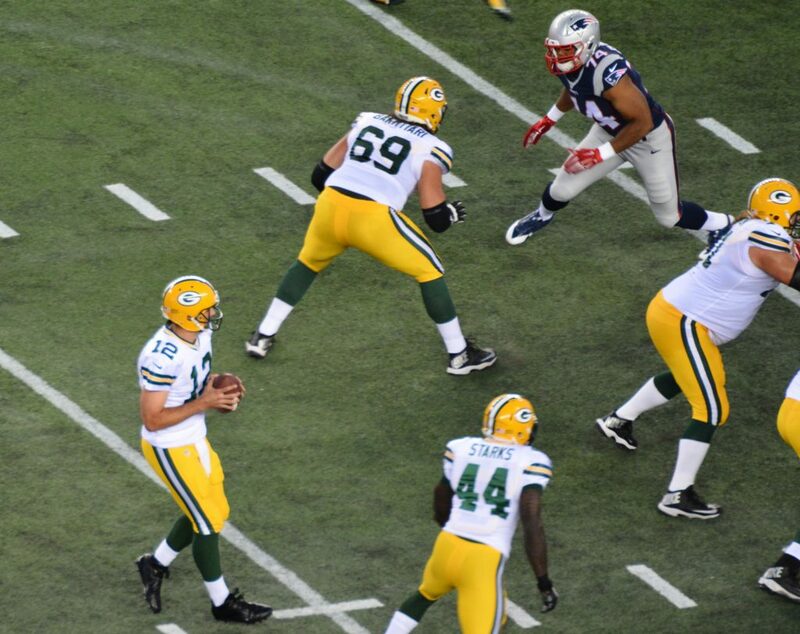 Flowers coming out party as a rookie featured a sack of Rodgers in Gillette several years ago in preseason. The Patriots will be hoping to see much more of that on Sunday night. The Patriots will be minus Shaq Mason on the interior of their offensive line this week and Ted Karras who subbed in for Mason when he first got hurt in Buffalo on Monday night. Mason hurt his calf against the Bills and didn’t return. Karras is the Patriots top backup at all three of the interior offensive line positions but is probably best suited for the center position but he’ll be at right guard this week. And his job will likely entail matching up with Mike Daniels and Kenny Clark, both of whom are having very solid 2017 campaigns. This will be a big test for Karras, he hasn’t played in a ton of games thus far in his career and the Packers will be looking to test not only his skill but his communication with the other offensive linemen when the Packers stunt, or blitz. There’s no pressure on Karras…right? He’s just on the stage with the two of the best QBs in any era and it is on national television to boot. The Patriots Swiss Army Knife has a lot of pressure on him since the injury epidemic has hit the New England running back position hard. Jeremy Hill is gone for the year with an ACL tear, Rex Burkhead is on IR with multiple concussions and isn’t eligible to return until Week 14. And Sony Michel seemed to avert serious injury in Chicago when his knee got twisted during a tackle. White has been just outstanding out of the backfield catching 55 passes for the Patriots for 459 yards and six touchdowns. His career high is 60 and he could possibly break that on Sunday night with another big game. The Packers at times play a lot of dime packages on defense and they may opt to try to take White away in the passing game by putting a defensive back on him rather than a linebacker which is a mismatch. But with Michel’s status up in the air this week, (he’s questionable, but we doubt he’ll play this week), the onus will be even heavier on White to produce. We’d expect to see Brady look his way often on Sunday, especially if the Packers begin blitzing. With Michel’s status in doubt and even Rob Gronkowski who is battling ankle and back injuries this week and is questionable to play, Edelman’s value as a circled member of trust with Tom Brady will no doubt play a big role this week. With Pettine’s defense which uses the old Rex Ryan overload schemes and multiple blitz packages, there will be times where Brady will be forced to make a decision and get the ball out very quickly. And in the past several years, he and Edelman have been outstanding at working in sync doing just that. Many times they’ll both recognize a look presnap and with just a look between the two, they’ll know right where they plan to go. Edelman had a big game in Buffalo and this game in Gillette against the Packers could be a tailor-made game for #11. Look for Brady to call his number early and often. 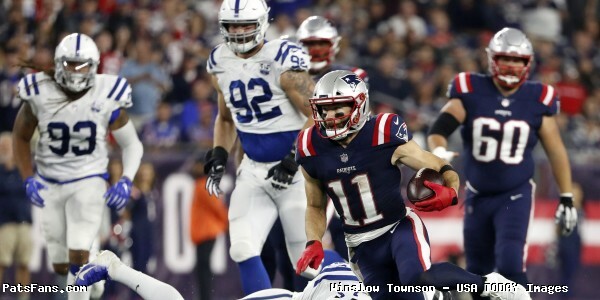 This entry was posted in 2018 Patriots Regular Season, NFL Commentary, NFL News, Patriots Commentary, Patriots Film Room, Patriots News and tagged 2018 Patriots season, Aaron Rodgers, Bill Belichick, Davante Adams, Green Bay Packers, Jaire Alexander, James White, Julian Edelman, Stephon Gilmore, Ted Karras, Trey Flowers on November 3, 2018 by Steve Balestrieri. Patriots-Packers Week 9, Key Matchups, Who Has the Razor’s Edge? 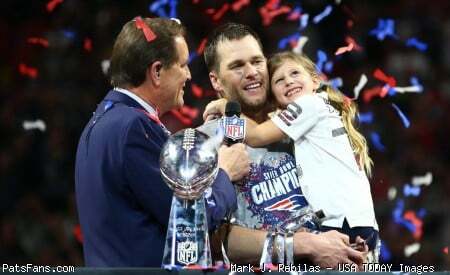 The New England Patriots return home for a Sunday Night Football game against Aaron Rodgers and the Green Bay Packers. The Patriots finished off a perfect (4-0) October and have won five games in a row. They’ll be looking to make it six against the very explosive Packers who are smarting off a late loss to the Rams. This week is the second Patriots prime-time game in a row and the fourth in the past five weeks. They’ve already appeared on Sunday Night Football twice this season. A week three loss to Detroit and the win over Kansas City. Amazingly enough, this is only the second time that Brady and Rodgers will be on the field against each other. That alone will be worth tuning in to watch two of the all-time greats to compete at the same time. The Patriots (6-2) defeated the Bills 25-6 on Monday Night. The game was actually much closer than that for the majority of the game but two late touchdowns put it away. The offense only scored one touchdown but the defense scored one and held Buffalo to only a pair of field goals. The Packers (3-3-1) lost to 29-27 to the Los Angeles Rams last week in what seemed like a home game for them in LA. Packers fans outnumbered the Rams fans but Ty Montgomery’s fumble on a kickoff return sealed it after the Rams kicked a go-ahead field goal. The Patriots and the Packers don’t meet very often, this will only be the 12th meeting between the two teams. The regular season matchup is tied at 5 wins apiece. The Packers beat New England in Super Bowl XXXI in the only post-season meeting. Green Bay beat the Patriots in their last matchup 26-21 in Lambeau in 2014. You would have to go all the way back to 2010 since the Packers last visited Gillette. That one was most remembered as the game that Rodgers missed with an injury and Dan Connolly, the Patriots right guard returned a kickoff 71 yards, nearly scoring a TD. It was also, coincidentally the last game the Packers lost that year. The Patriots running game had taken off during the last month as Sony Michel has given the Patriots the balance on offense that they were looking for. It worked so well that they were averaging 38 points or better every week for that month. But injuries have really hurt the position. Jeremy Hill was lost for the year with a torn ACL, Rex Burkhead was placed on IR with multiple concussions, (he can’t return until Week 14). And then Michel went down in the loss to the Bears. They were forced to use WR Cordarrelle Patterson in the tailback role in Buffalo and he, not surprisingly had issues finding holes to run thru. The Packers have had some issues stopping the run and are allowing 119.1 yards per game and 4.4 yards per rush. Part of that rests with the aggressiveness of the defense, Mike Pettine uses the old Rex Ryan Jets overload scheme and they can be susceptible to the quick hitters to beat the blitz. With Michel in the backfield, the Patriots would get the nod here, but I tend to think that although he’s back at practice, he probably won’t be able to go this week. That gives the nod to Green Bay. The Patriots have plenty of weapons for Tom Brady to utilize with Julian Edelman back in the fold, although both Josh Gordon and Rob Gronkowski have been slowed by injuries. Brady also has Chris Hogan and the invaluable James White out of the backfield. Gronkowski, just coming off ankle and back injuries was laboring in Buffalo. On a short week, it will be interesting to see if he gets a jump back in his step. More intriguing is the injury to Edelman. He took a shot to his shoulder/neck area in Buffalo and was in obvious discomfort the rest of the game. He missed practice on Weds. If he can’t go it is a huge blow to the offense, that is already hurting. The Packers have been very improved against the pass this season. Led by Jaire Alexander, they cover much better and they have 23 sacks thus far. The overload schemes make things very difficult on the opposition. They allow just 221.7 yards per game thru the air which is the 5th best in the league. One question will be who replaces Ha Ha Clinton-Dix at safety. Dix was traded at the deadline and played nearly every snap this season. He was the team’s leading interceptor (3) and second-leading tackler (27). They probably will turn to Jermaine Whitehead who was their go-to guy in sub packages, but we may also see CB Tremaine Williams at times. When Pettine was in Cleveland, he often would play Williams at safety. They also have 2017 2nd round draft pick Josh Jones, but he’s been mainly a special teamer this year. If he can go this week, this will be another tailor-made game for Julian Edelman. His ability to make the tough third-down catches and with he and Brady having the chemistry to read presnap what the defense may do, he’ll be invaluable when the Packers blitz. We look for James White to get a lot of looks once again in the passing game. He currently leads to the team with 55 catches. It should prove to be an interesting chess match between Pettine and Brady. The two have faced each other quite frequently and the GB defensive coordinator will show plenty of different looks trying to confuse Brady. They’ll show six or seven at the line and then drop seven into coverage or overload blitz on one side. With Marcus Cannon and Shaq Mason banged up on the offensive line, the communication between the backups will be key. The Green Bay running game will scarcely miss Montgomery after his trade. He fell to the third position in their running game by committee group. They have found their man, however, in their 2nd year running back Aaron Jones. While he’s not the biggest guy at 5’9, 208, he is electric with the ball in his hands. Last week his 33-yard touchdown right up the middle sparked the Packers comeback in the second half. The Patriots run defense has been steadily improving over the course of the season. Last week they held Bills running backs to just 46 yards in 19 carries. Shady McCoy had just 13 yards on 12 carries. The big men in the middle plus improved linebacker play has been the difference. Kyle Van Noy filled in for Dont’a Hightower last week and was outstanding in the middle. Look for the Packers to feed Jones who had a career-high 12 carries last week more than that on Sunday night. With the Patriots possibly opting to bring A-Gap pressure with either Hightower or Van Noy, it will be the perfect antidote. The Packers Aaron Rodgers is averaging about 308 yards per game and has a plethora of talented receivers who can all be dangerous with the ball in their hands. It starts with Davante Adams who leads the team with 52 catches for 690 yards and six touchdowns. He’s a threat to take it to the house on every down if he gets free. Rodgers also has Randall Cobb, TE Jimmy Graham, Geronimo Allison, and Marquez Valdes-Scantling and reserve TE Lance Kendricks who can chip into the passing game. Rodgers remains excellent at making plays with his feet, once he’s flushed out of the pocket. The Packers have given up 24 sacks but coming after Rodgers is a risky proposition. The Patriots have given up a lot of yardage this season, that won’t change on Sunday but the key is making some stops in the red zone. Going back to that 2014 game, Rodgers shredded the NE secondary but they only scored two touchdowns. They’ll need that kind of effort again. The issue is pressure or lack of it from the Patriots defensive line. They have to squeeze the pocket without losing containment or they’ll get toasted this week. Look for Rodgers to spread them out and try to run those crossers underneath that drive the Patriots mad every week. Adams and Stephon Gilmore should be a good battle to watch but the key this week is the secondary targets Cobb and Allison going against Jason McCourty. The Patriots will also have to watch Graham closely with Chung and LB help. The Patriots have gotten another very solid season from Stephen Gostkowski but the rest of their special teams play has been wildly inconsistent. After getting two scores from STs in Chicago, they took a step back in Buffalo. The Packers counter with the normally automatic Mason Crosby but he went thru a rough patch and has only hit 17-22 field goals this year. Their return game is where they miss Montgomery the most. They can either use Marquez Valdes-Scantling or activate WR Trevor Davis from IR. This much-ballyhooed matchup between Brady and Rodgers who both throw the ball extremely well may come down to which team runs the ball better. The Packers are a much better team than their 3-3-1 record indicates and could easily be a 5-2 or 6-1 team right now. Part of that rests on head coach Mike McCarthy. They’ve come out flat in a few games and they saw that they just can’t show up and win. They came out strong and played an excellent 60-minute game against the undefeated Rams last week and if not for Montgomery’s fumble may have won that one. Now they travel to Foxboro to take on the Patriots where they are awfully tough to beat. Rodgers has the personnel to do that and the experience to take what is out there. They won’t panic if they get down a score or two because they are so explosive. Third downs and special teams play may ultimately decide who takes away the win here. While a lot of people are expecting another huge scoring game akin to the Kansas City Week 6 matchup, I see this one playing out like the 2014 game, with scoring in the mid to high 20s. 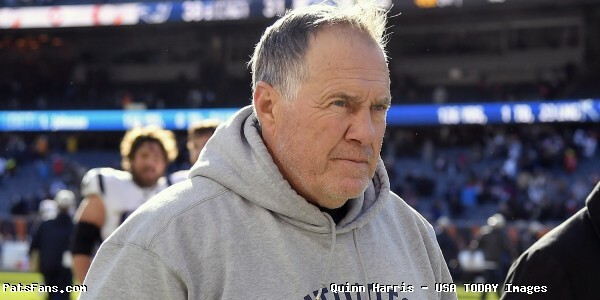 This entry was posted in 2018 Patriots Regular Season, NFL Commentary, NFL News, Patriots Commentary, Patriots Film Room, Patriots News and tagged 2018 NFL Season, 2018 Patriots season, Aaron Rodgers, Bill Belichick, Buffalo Bills, Chris Hogan, Davante Adams, Dont'a Hightower, Green Bay Packers, Haha Clinton-Dix, Jaire Alexander, James White, Jimmy Graham, Julian Edelman, New England Patriots, NFL, Patriots, Randall Cobb, Rob Gronkowski, Sony Michel, Stephon Gilmore, Tom Brady, Trey Flowers, Ty Montgomery on November 2, 2018 by Steve Balestrieri. In this episode, we started the show by looking back at the Patriots victory against the Bills. We ended the show by previewing the upcoming game against the Packers. This entry was posted in Patriots Podcast and tagged Bill Belichick, Bills, Green Bay Packers, New England Patriots, Patriots, Tom Brady, Trey Flowers on October 30, 2018 by Russ Goldman.